Republicans are 66 percent favorites to win a Senate majority, according to the latest FiveThirtyEight Senate forecast. New polls confirmed GOP advantages in Arkansas and Colorado, and a generic ballot survey from AP-GfK found Republicans up 8 percentage points — an unusually large lead. But — as I’ve written before — there’s a good chance we won’t know who controls the next Senate when the sun rises on Nov. 5. We may have to wait, as we did for the 2000 presidential election. But not because of hanging chads and the Supreme Court. With a possible runoff in Georgia, a probable runoff in Louisiana and the specter of independent Greg Orman in Kansas taking his sweet old time deciding whom to caucus with — not to mention potential recounts — the 2014 midterms may remain unresolved until you’re shopping for Christmas presents (or even making New Year’s resolutions). So we’re introducing a new metric as we enter the campaign’s final stretch: The probability that Republicans or Democrats will have a majority of Senate seats on or near Nov. 4. We’ll call this a regulation-time win. Any race with a margin of victory within 0.5 percentage points (which could necessitate a recount). If the GOP has at least 51 seats without these cases, that’s a regulation-time win. If Democrats have at least 50 seats without these cases (with Vice President Joe Biden breaking the tie in the Senate), that’s a regulation-time win. 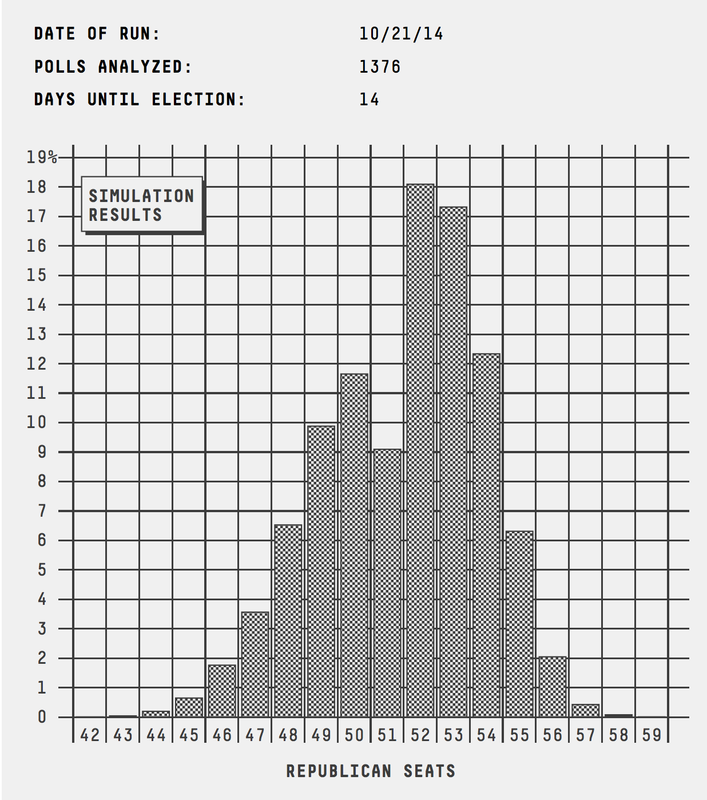 As of Tuesday’s model run, there is a 53 percent chance we’ll be able to project Senate control near Nov. 4; 47 percent of the time, the midterms go to overtime. It’s basically a coin flip. Republicans have a 38 percent chance of securing the majority near Nov. 4. Democrats have only a 15 percent chance. It’s possible this calculation underestimates the chances we’ll know the winner within a day or two of Election Day. In 2008, it took two weeks for Sen. Mark Begich to be declared the winner in Alaska. His margin of victory was small but not that close. He won by just over 1 percentage point. It’s not hard to imagine that even a 2 percentage point or 3 percentage point victory could take a while to finalize in Alaska. Republican Dan Sullivan is projected to win Alaska by about 4 percentage points. If we assume we won’t know Alaska right away, the chance of a regulation-time win for either party falls to 36 percent — 64 percent of the time, we’re left waiting (without a call in Alaska, the GOP wins in regulation 24 percent of the time, and the Democrats win and avoid overtime in 12 percent of simulations). The GOP’s most likely path to regulation-time victory includes sweeping Alaska, Arkansas, Montana, South Dakota and West Virginia. FiveThirtyEight currently has Republicans with at least a 75 percent chance of winning in each of these states. The GOP would also need to win three of the following five states: Colorado, Georgia, Iowa, Kansas and Kentucky. FiveThirtyEight has Republicans as 74 percent favorites in Colorado, 65 percent in Iowa and 78 percent in Kentucky. Results in these states are correlated, but not enough to make Republicans favorites to sweep all three. FiveThirtyEight also forecasts that Georgia is more likely than not to go to a runoff, and that Orman has a 54 percent chance of winning in Kansas. Fortunately for political reporters who have scheduled vacations in November or December, it’s still more likely than not that someone will win in regulation time — but just barely.